In today highly competitive job market, employers are looking for more than just a university qualification when hiring graduates. According to recent surveys from graduate employers in Australia, it is revealed that graduate employability skills, such as communication skills and teamwork, are the top requirements across many graduate positions and graduate programs. In fact, hiring managers are actively looking for graduates with the right attitude and passion. Furthermore, they should acquire an ability to learn and broaden their skill sets outside universities and a focus on soft skills development. 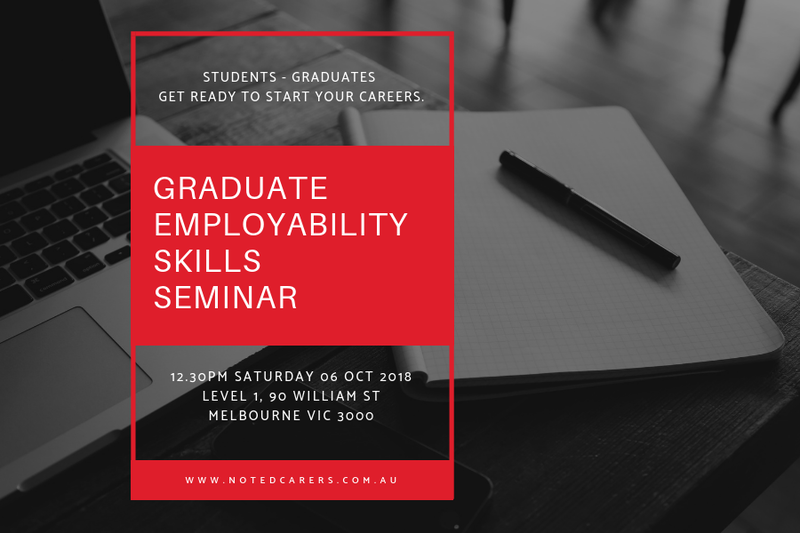 NotedCareers and Accounts NextGen proudly introduce Graduate Employability Skills Seminar on Saturday, 6th October 2018. This is designed exclusively for commerce students and graduates in Melbourne. The seminar provides insights into employers’ expectation in graduates, job seeking advice, updates on the accounting industry and introduction to an accounting software. NotedCareers pride to inspire talents and leaders in Australia to realise their potentials, unlock their career prospects, improve their personal lives. As the result, we want to make a positive change in industries and the community. With an appreciation of the uniqueness of individual talent and career needs, our experienced consultants partner with each professional to construct the most suited one-on-one program. Each program will then consist of different career coaching modules and professional development training to achieve individual career objectives. Accounts NextGen has been in the accounting and finance business for 7 years. We are serving more than 500 happy clients with all their financial needs. Accounting is our passion, above this, we constantly engage ourselves in researching new and latest technologies of accounting. We have brought knowledge and expertise from more than 65 highly qualified consultants. This has, thus, helped us to assist our clients in various accounting and financial situations. With information from NotedCareers principal consultants and Accounts NextGen experts, the seminar will also empower you with a clearer vision of your career path. So, register your seats for you and your friends, join the seminar, and discover your potentials! What’s more, want to talk to an expert about your career prospects today? Call us on 1800 326 422 to book a consultation!